I was trying to keep out of this awful project but we had a request for support from tenants in Camden, part of the pan-Camden HS2 alliance, and I’m glad to say that three UCL Bartlett students offered to help (I’ll name them if they agree). We took part in some meetings, wrote some structuring suggestions to frame the immense local and technical knowledge available and provided some editorial support. We hope it was helpful. Will add some links when I have them. One step forward but now a step back. A welcome board for the Olympics is sitting in the Euston Forecourt which directs people East to the British Museum. Should be South. And remind me about the “sculpted” bit of Regent’s Park… Must be the flattest place in London. 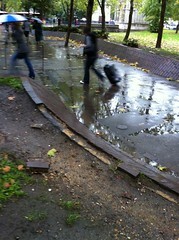 Later (7 October 2012): Drainage still keeping the puddle empty two months later. It really does seem to work. Now let’s see if anyone clears the drain when it next clogs. In other Euston news: UCL is moving into some of the office blocks vacated by Network Rail. Nice for passing UCL people because our Eduroam WiFi fills the forecourt, hitherto (and still for everyone else) a nasty pay-zone. 19 April. 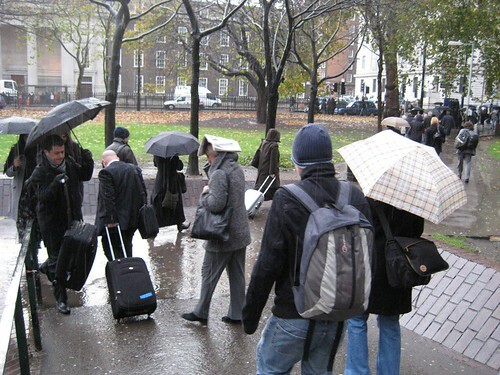 London is ensuring that this historic puddle, which for years has been delaying and infuriating passengers entering and leaving Euston Station, is conserved as part of preparations for the 2012 Olympic and Paralympic Games, starting 100 days from now. 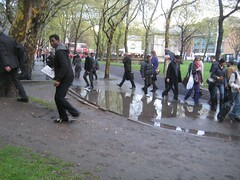 As the rains begin in October 2010, back comes the Euston Square Puddle.